The Oak Lake Mennonite Church began with a group of immigrants from the Soviet Union that began holding worship services in 1928. They were formally organized in 1929 as an affiliate of the Schoenwieser Mennonite Church group. 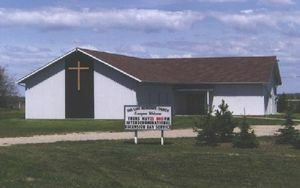 This congregation was located the farthest west in the province of Manitoba of any of the worshipping groups of the Schoenwieser Mennonite group. The congregation met in homes for the first ten years and then they rented the Pleasant Plains school until they built their own meeting house in 1949, located at the SE quarter of section 28 in township 9, range 24 west of first meridian (SE28-9-24-W1). Due to the new four-lane highway proposed by the Provincial Department of Highways, the final service in this building occurred on 18 March 1990. A new church building at 200 Oxcart Trail East, in the town of Oak Lake, became the next worship location on 1 April 1990. The congregation followed the pattern of having lay ministers. Peter Penner was considered to be the founding leader of the group. In 1974, Oak Lake Mennonite congregation was the last worshipping group to separate and become independent from the Schoenwieser Mennonite church group. From the late 1950s and throughout the 1960s, the congregation added a boys and girls ministry, a Sunday school, and a Christian Service Committee. The language of worship transitioned from German to English in 1961. In 1982 a decision was made to allow lay members to deliver the opening at the Sunday morning services once a month, affirming the role of lay leadership. The leading minister in 2015 was David Sawatzky. Ens, Anna. In Search of Unity: Story of the Conference of Mennonites in Manitoba. Winnipeg, MB: CMBC Publications, 1996: 186. Enns, Egon. "History of the Oak Lake Mennonite Church to January 1967." Research paper, Canadian Mennonite Bible College, 1967: 18 pp. Mennonite Heritage Centre. Klassen, Is. Dem Herrn die Ehre: Schoenwieser Mennoniten Gemeinde von Manitoba, 1924-1968. Altona, MB: The Conference, 1969: 29-37. Mennonite Reporter (15 September 1986): 14; (4 September 1989): 16. Epp, Marlene and Alf Redekopp. "Oak Lake Mennonite Church (Oak Lake, Manitoba, Canada)." Global Anabaptist Mennonite Encyclopedia Online. November 2015. Web. 21 Apr 2019. http://gameo.org/index.php?title=Oak_Lake_Mennonite_Church_(Oak_Lake,_Manitoba,_Canada)&oldid=138404. Epp, Marlene and Alf Redekopp. (November 2015). Oak Lake Mennonite Church (Oak Lake, Manitoba, Canada). Global Anabaptist Mennonite Encyclopedia Online. Retrieved 21 April 2019, from http://gameo.org/index.php?title=Oak_Lake_Mennonite_Church_(Oak_Lake,_Manitoba,_Canada)&oldid=138404. This page was last modified on 6 October 2016, at 06:44.